Bianchi have extended their CounterVail vibration-reducing technology, designed to reduce muscle fatigue and increase control, to cover their new Specialissima lightweight road bike. Bianchi first introduced CounterVail on their Infinito CV (CV for CounterVail) endurance bike. CounterVail is a structural carbon system with a viscoelastic resin from Materials Sciences Corp that’s embedded within the frame’s carbon layup. The idea is that it cancels out road vibration to reduce muscle fatigue and save energy while improving handling and control. 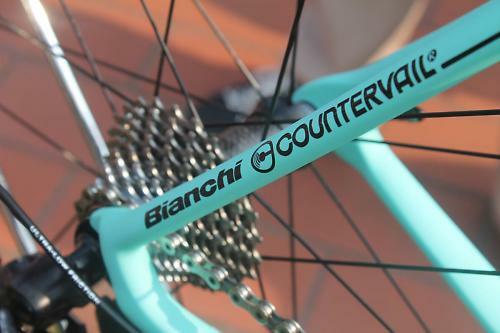 CounterVail is exclusive to Bianchi in the cycling industry. 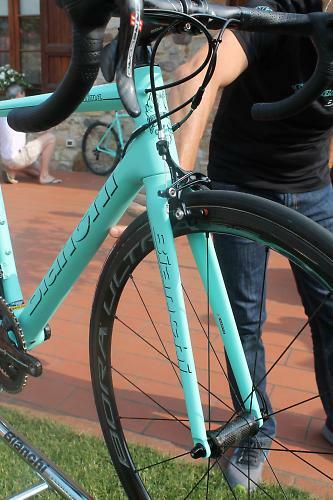 We’ve reviewed the Bianchi Infinito CV and said that it delivers an astonishing ride. Now Bianchi have added the CounterVail tech to the brand new Specialissima lightweight road bike. 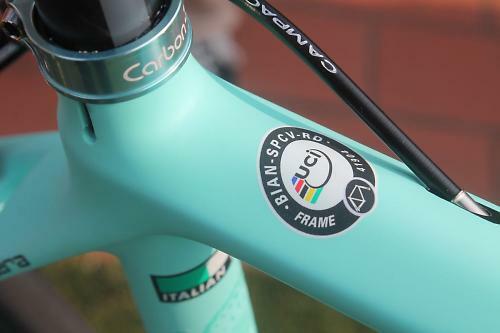 We knew that the Specialissima CV was on the way because it has been on the UCI’s list of approved race frames from the start of the year, and we’ve spotted it being used by Team Lotto NL-Jumbo, but it has been officially launched today. 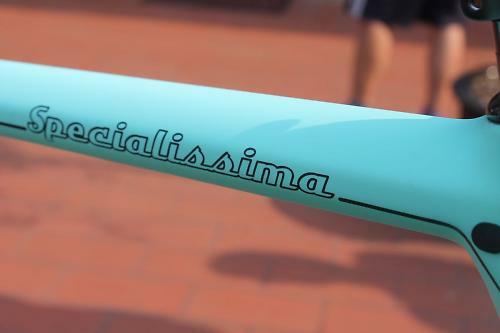 Specialissima isn't a new name for Bianchi – Fausto Coppi could be found astride one back in the 1950s – but this new bike is very different from Il Campionissimo’s. Bianchi have also used CV on their Aquila TT bike. Why? They say that it helps maintain the best aero position over varied road conditions, reduces upper body muscle fatigue, empowers leg strength, increases overall endurance and reduces energy consumption. Back to the Specialissima. 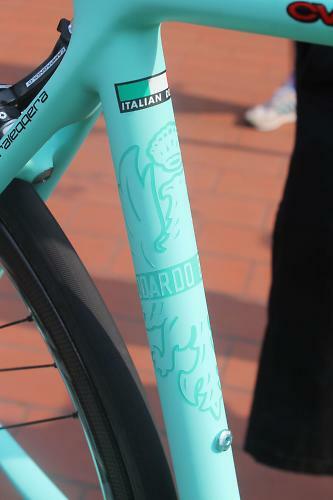 Bianchi are using an ultra-light formula here. They say it is fast and reactive when climbing and offers unparalleled control and precision on the descents. The frame weight is a claimed 780g (for a 55cm model in black). The fork weighs 340g and uses the same CV technology. It has a crown that's integrated into the head tube, and straight blades. Bianchi reckon the CV provides excellent traction and stability at high speeds. Essentially, they're saying that the CV stops a lightweight bike skittering about on uneven roads, and allows you to descend fast because of less vibration. The rigidity of the frame comes courtesy of the high modulus carbon fibre used in the layup. “The new Countervail ultra-light carbon formula is tuned to smooth out the inherent nervousness of ultra-light frames,” say Bianchi. The frame is compatible with both mechanical and electronic shifting, but it'll only come specced with top-level groupsets: Campagnolo Super Record mechanical and EPS, and Shimano Dura-Ace mechanical and Di2. All cables/wires are internally routed except the cable from the bottom bracket to the rear mech on the mechanical models. Bianchi are using the PressFit 86.5mm standard bottom bracket. The seatpost is a 27.2mm seatpost, chosen for its light weight. 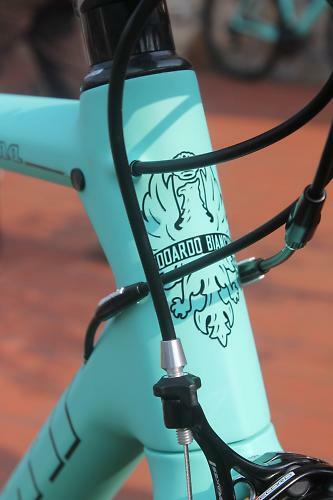 The profile of the tapered head tube draws inspiration from Bianchi's Aquila CV time trial bike. Extra weight is saved with full carbon dropouts, Bianchi just using very small metal inserts where the quick release axle touches them. 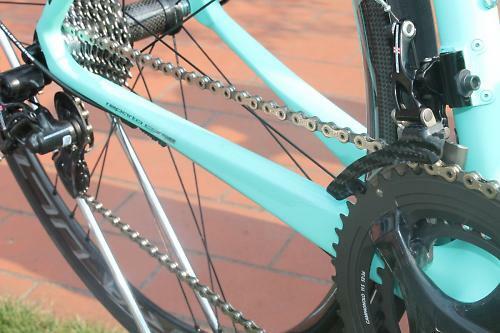 The geometry is pure race and the Specialissima will be offered in sizes 47, 50, 53, 55, 57, 59 and 61cm. It'll be available in both black and a new celeste flouro, which is what it sounds like: very bright celeste. Bianchi are also offering custom colours so you can have pink, yellow or whatever else you want. All Specialissimas are handpainted in Italy. No decals are used; all the logos are produced by masking and painting. The overall look of the finish is minimalist, with nothing in the way of fancy graphics. As well as keeping the weight down, that gives a classic appearance.